"Tidal Pool" is only $10.00CAN plus $3 shipping! Live extended vocal improvisations with multi-effects processing and occasional keyboard accompaniment. Created in real-time, with no post-processing. 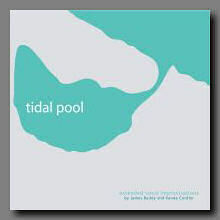 Well known as both a musician and strong supporter of the Toronto abstract/ambient scene, James Bailey has collaborated on his latest release with Vanda Cordier under the name Tidal Pool, a duo who's self-titled debut inspires the imagination through its fascinating use of processed vocals. Using distorted and manipulated voices, Bailey and Cordier have recorded and improvised this collection of tracks in real-time, a process that gives the disc a feeling of urgency and spontaneity. Opening with "He Stole My Sound", the disc begins with a chaotic mixture of noises and voices that cross a wide range of emotions and moods. By turns dark and ominous or playful and humorous, "He Stole My Sound" is a fascinating journey through musical stylings that captures the Tidal Pool aesthetic in its truest form. "Syren" follows a more conventional route, using delayed vocal lines to create a constantly shifting tableaux of sound. The track reminds me of the work of Sara Ayers, a chilling yet beautiful celebration of vocal stylings. The vocal work is so moving and enveloping here that when a droning sound enters the soundfield it's almost startling to the listener. Bailey's interest in field recordings comes into play later in the second half of the track where the sound of a beach at high tide acts as a focal point for the work. Another fascinating track by this very engaging duo. Recorded before a studio audience, "Regarded with Lack of Clarity" employs vocal improvisation and abstract processing to create a fascinating amelodic non-music. Words and phrases weave around each other, at some times clearly spoken, at others garbled and impossible to understand, bouncing around the soundfield in any number of directions. Cordier also uses an undulating singing voice in this track that's particularly impressive. "That Train Again" features the duo using onomatopoeic vocals to create a dense wall of sound and noise. Through clicks of the tongue, shrieks and yells, grunts and moans, it all adds up to make a very solid, very impressive structure of tones. "In the Stellar nursery" closes the disc with a vocal recreation of space music. Haunting wails serve well as drones, echoing pants create a nearly melodic line, with other vocal stylings filling in the roles of other cosmic tones. It's an impressive track and a testimony to the skills and abilities of the duo. With the release of "Tidal Pool", Bailey and Cordier have crafted a fascinating release that, while maintaining a certain abstract edge, resonates on a very organic level as sound created by human voices. Walking an artistic tightrope between these two ideals, the duo have struck a neat balance in style that is as impressive as it is engaging. A truly fascinating release that comes highly recommended.